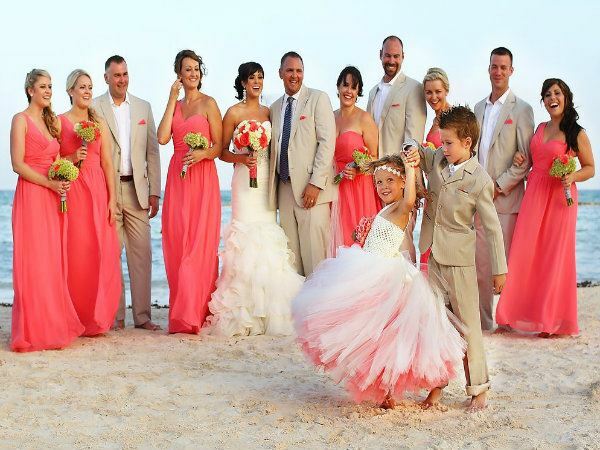 Children are adorable little people with vibrant personalities that can truly show if they love their wedding outfits! If you're about to attend a wedding with your kids, we know it can be tough to figure out how to dress the kids so that they're happy (which means you're happy) and so that they look presentable and photo-ready at all times. With these 4 steps, you won't need to fret - your children will look as sensational. Our luxury Wedding Planners at Velas Weddings have put together this guide so you can relax and enjoy these special moments with your children. Step 1: Are your children in the ceremony? If your child is a ring bearer or a flower girl, make sure to talk with the bride and groom to know what plans they have. Follow the color scheme and theme of the wedding to ensure your child fits in. On the occasion that the bride and groom give you free reign, remember that tasteful princess dresses will work for girls and a breezy, comfortable suit will work for boys. Neutral colors are always stunning for beach weddings as well as fabrics that are lightweight and breath nicely. Most children have style preferences that characterize him or her, especially the older ones. If your daughter prefers ankle-length dresses to knee-length or if your son is more comfortable with matching trousers and a button up shirt rather than a full suit, feel free to use this as a cue for styling them so they're happy and comfortable throughout the ceremony and the reception. Step 3: Comfort is key! Children will be children, playing and dancing with friends. Keep them stylish and practical by avoiding tight fitting clothing or light colors. Loose fitting clothes look great on the beach and keeps kids cool in the Mexican weather. For shoes, aim for stylish yet comfortable flats for girls and comfortable leather shoes for boys. Add some charm to their little wedding outfits by choosing accessories that display their personalities. Seashell headbands in your daughter's hair for a beach wedding and maybe let your son choose his own snazzy bowtie to give pizzazz to a boring suit. With these four simple steps, dressing a child for a wedding will be fun and easy! For more wedding trends, tips and much more, we invite you to take read and subscribe to our luxury wedding blog. If you are just beginning to plan your wedding and you're thinking about a destination wedding in Mexico, check the availability of your date below. At Velas Weddings, we are specialists in luxury beach weddings and we have exclusive resorts in the best beaches in Mexico. Our venues at Grand Velas Riviera Maya, Grand Velas Los Cabos, Grand Velas Riviera Nayarit, Velas Vallarta or Casa Velas in Puerto Vallarta are perfect for spectacular destination weddings on the beach. Simply select your date and leave the rest to us! We'll plan each detail to ensure you have the perfect day. Contact our Wedding Planners today! Simply fill out this form and we'll be in touch to provide you with all the information you need to start planning your dream wedding at Velas Resorts!